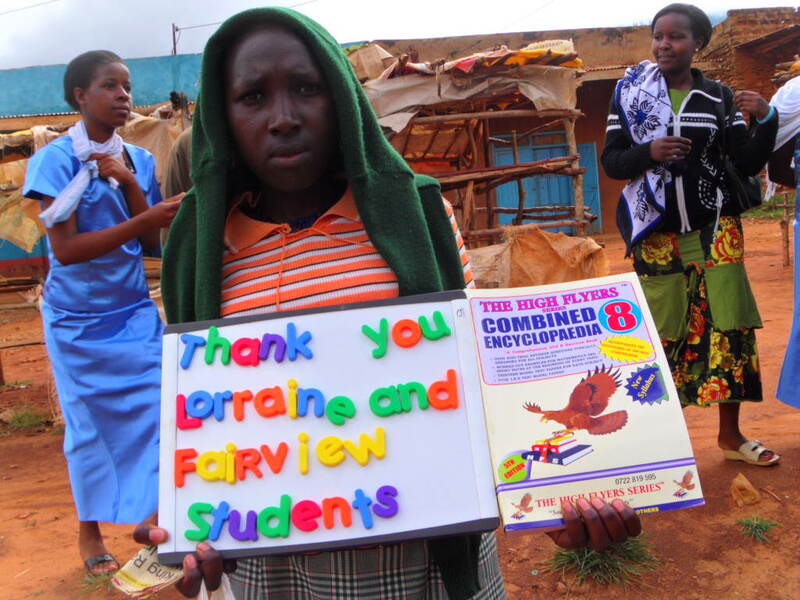 Fairview Public School in Mississauga continues as one of strongest supporters. 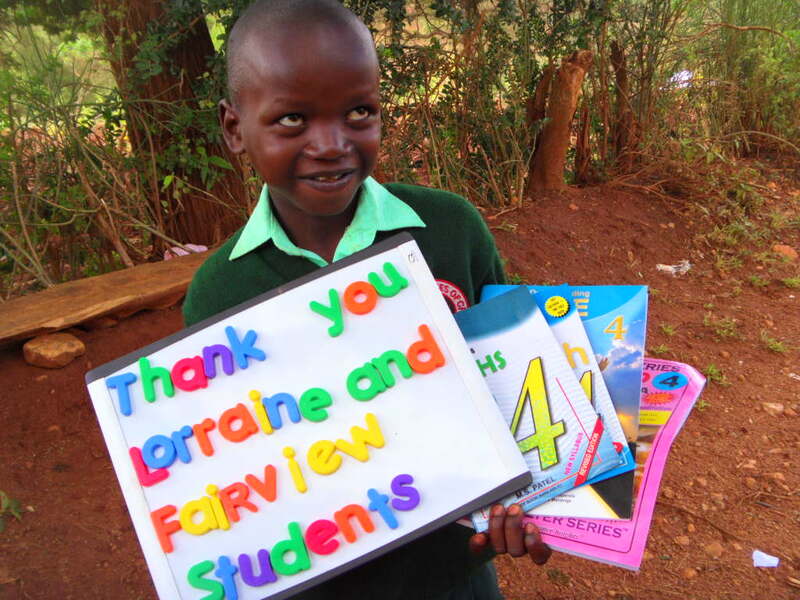 Leadership in this school has been supplied by Lorin Trevisan and Lorraine Toma-Jones. 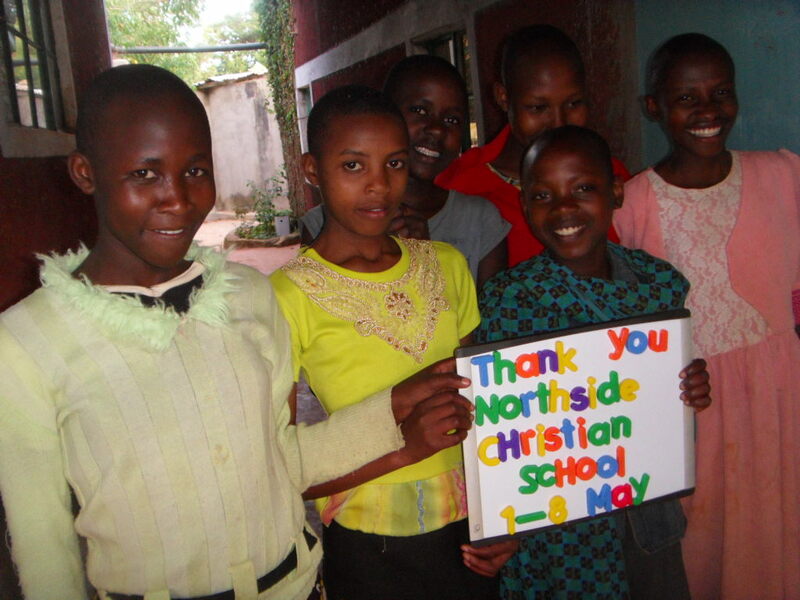 The school donated $2143.27. This amount was generated primarily by popcorn sales! 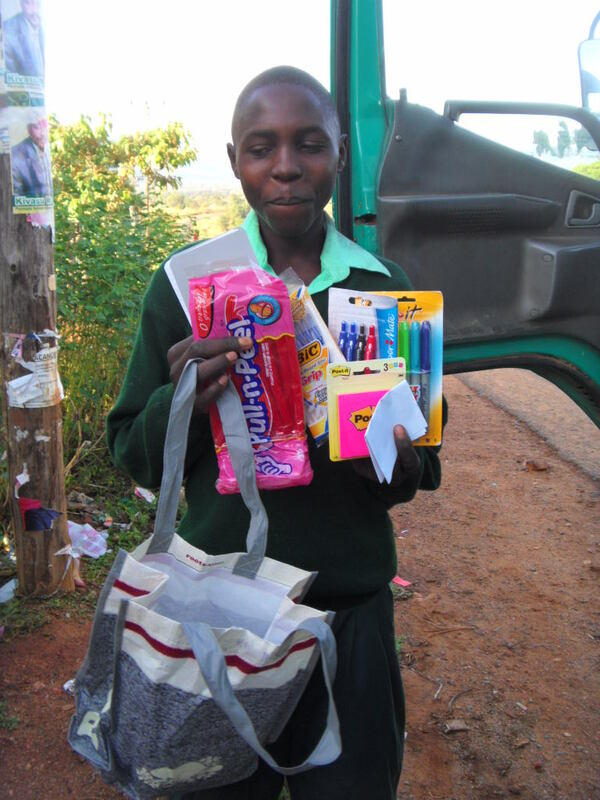 And here are the first pictures of the items being distributed! 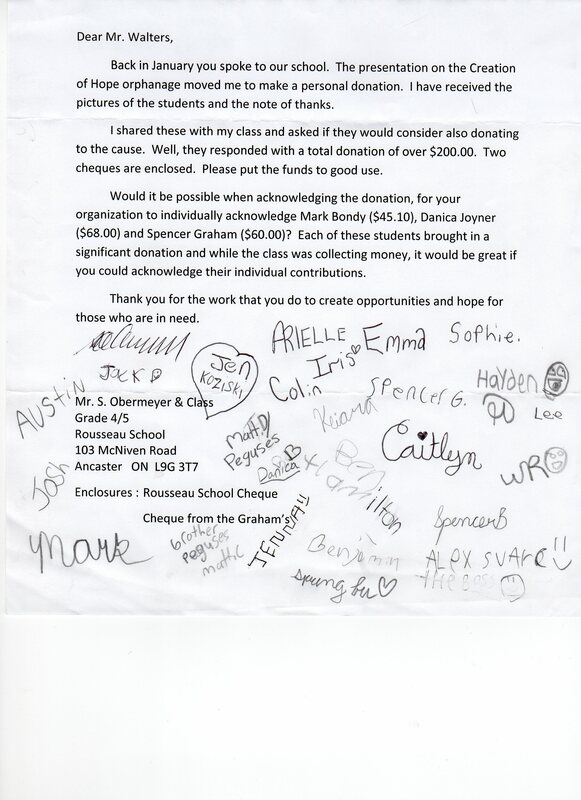 Mr. Obermeyer’s class at Rousseau School in Ancaster donated $211.65. 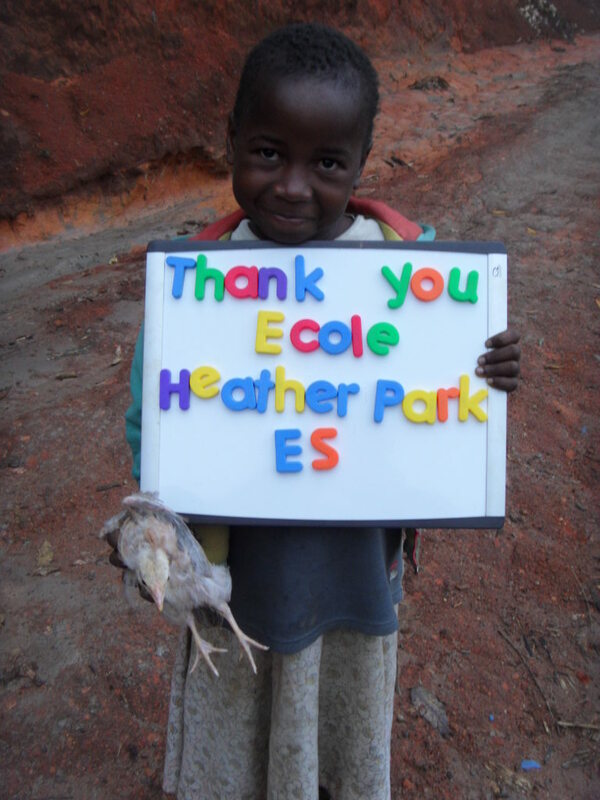 As written in the letter below we wish to offer special thanks to Mark Bondy, Danica Joyner and Spencer Graham. This money is going to be used to support the entire Rolling Hills Residence for 4 days and to purchase a uniform for a needy orphan. 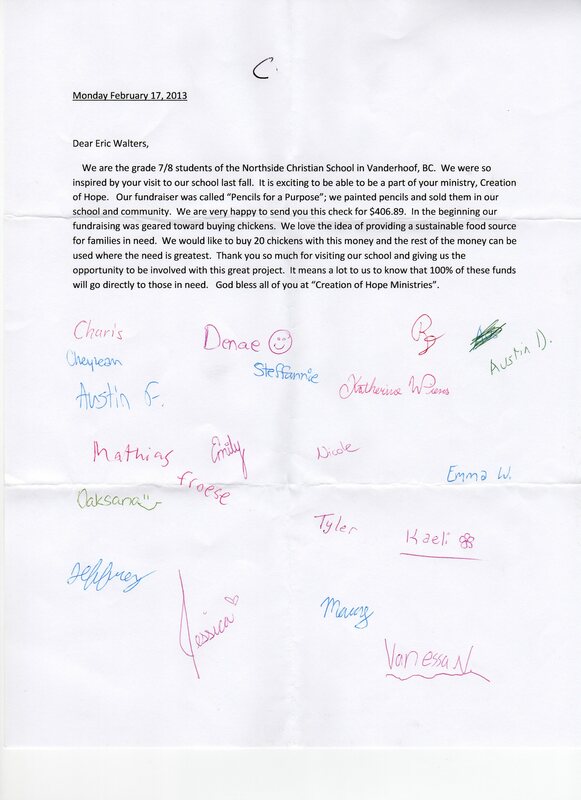 The students of Northside Christian School in Vanderhoof have shown their faith through their actions. 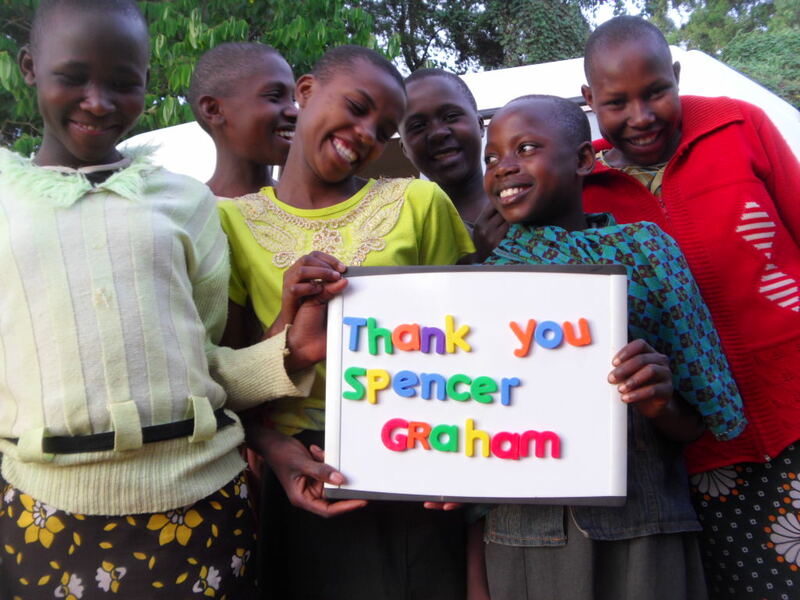 This money will be used to provide 8 days of support for the entire Rolling Hills Residence and for a blanket. Associated Hebrew Schools – Danilack Middle School – sent a donation of $14.81. 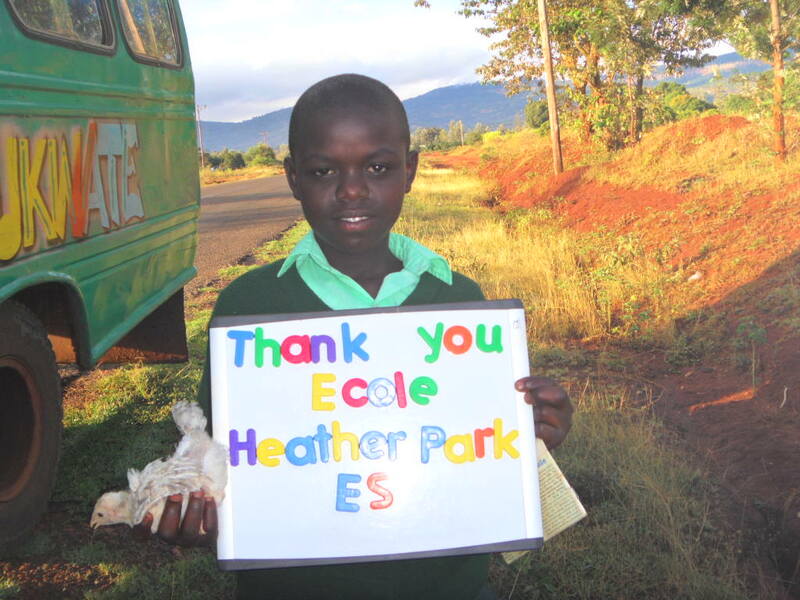 This was part of their initiative to learn about charities and offer support. Our thanks. 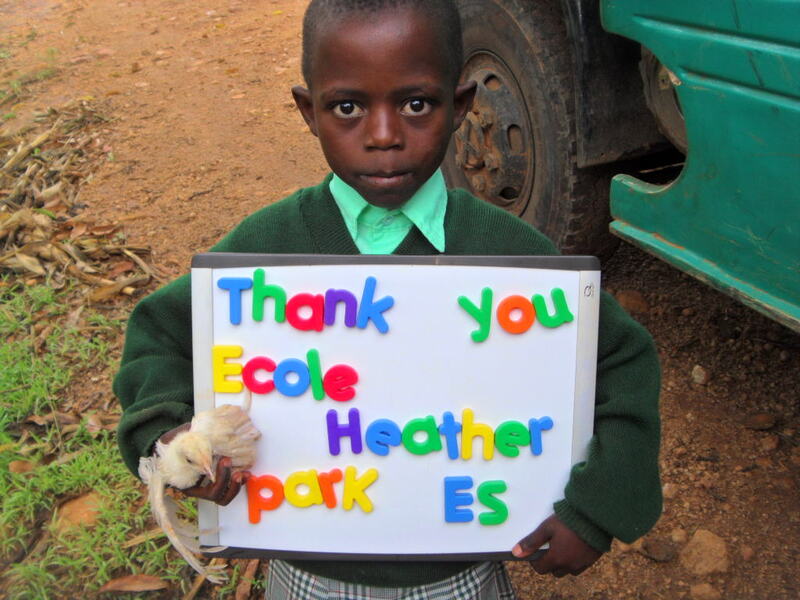 Kelowna Secondary School donated $50.00 –which will be used to support the Rolling Hills Residence for a day. 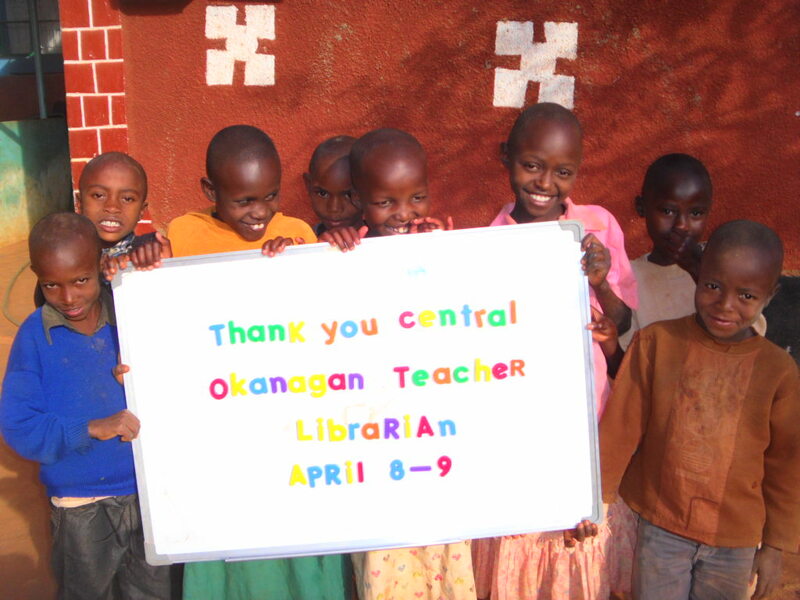 During my recent tour through Kelowna, I was hosted in a wonder event organized and financed by the Central Okanagan Teacher Librarian Association. 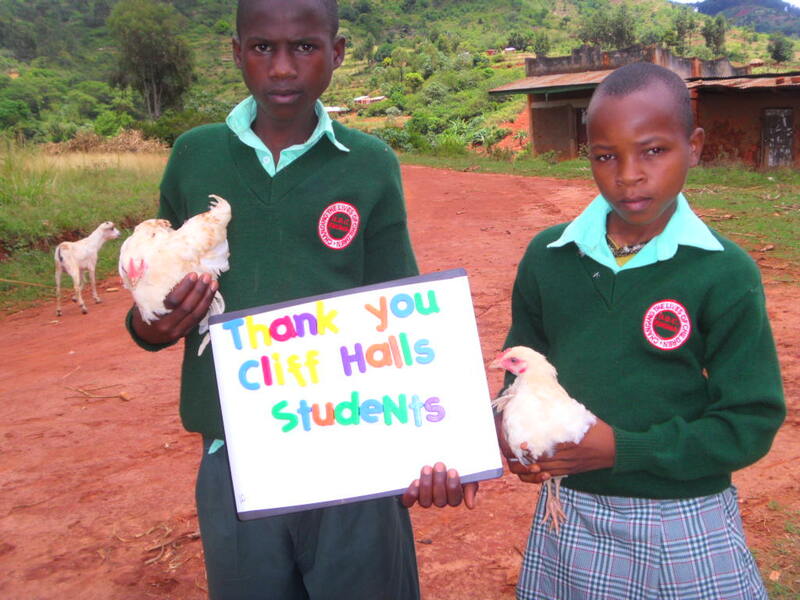 They made a donation to support the Rolling Hills Residence for 2 days. Special thanks to Jim and Pat. Emily Mednis made a donation which will be put toward school supplies. Her mother, Christine, also made a donation which will be applied to the used vehicle to be purchased in the coming months for our program. 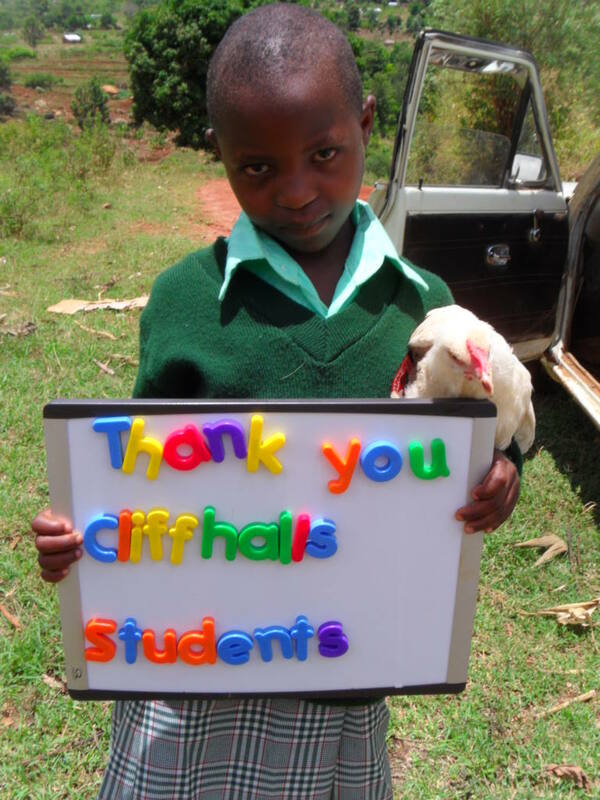 Ingrid and Keith Evans made a donation to support the Rolling Hills Residence for 1 day. 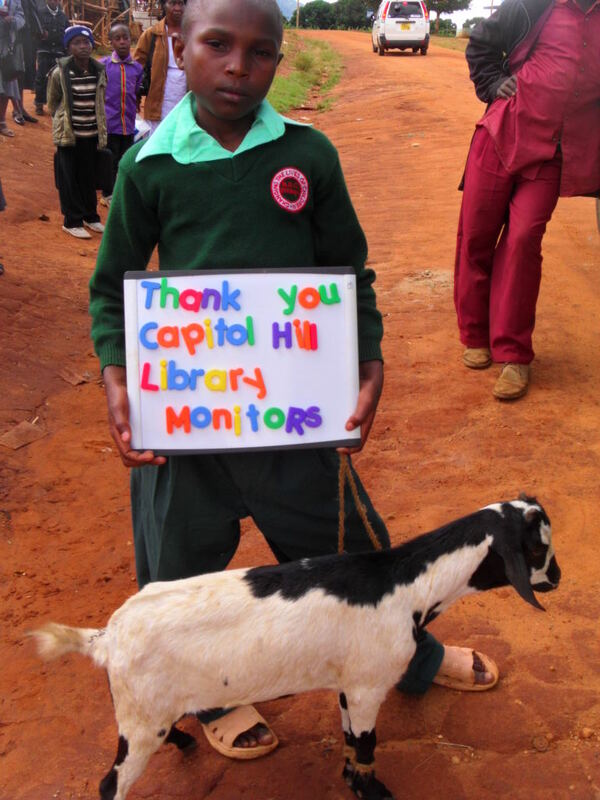 Vesna made a donation to purchase a goat with thanks going to her helpers, the Capitol Hill Library Monitors. After a presentation, a young man named Dmitry came up and gave me $20.00 to be used for the program. He will receive pictures from Ruth to confirm how we used this money in the coming month or so. At another presentation a young girl, Kaleigh, pulled out the change in her pocket – the only money she had – and donated it to the program. 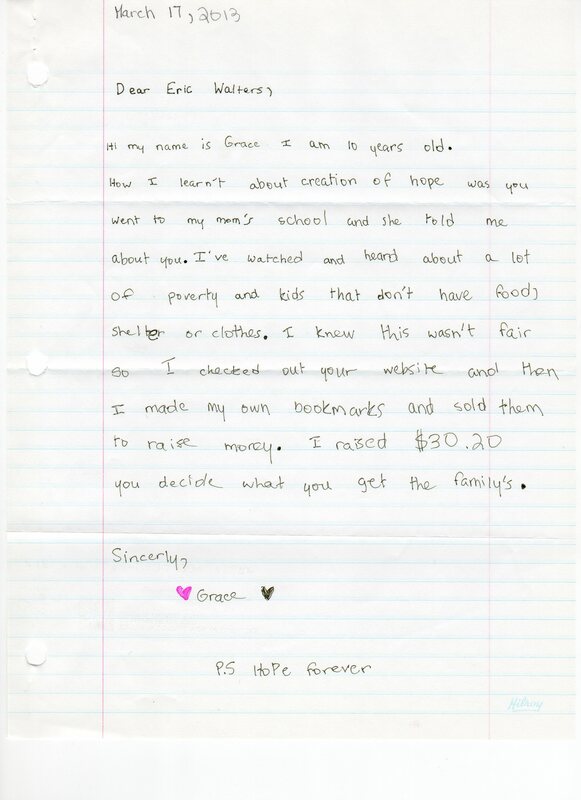 And here’s a letter from another young donor. 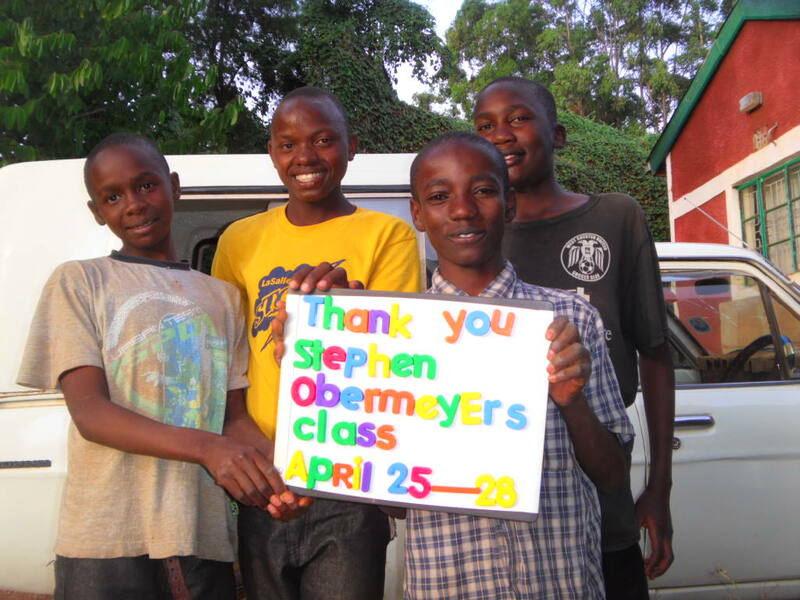 The actions of young people like Dmitry, Kaleigh and Grace are what keeps me inspired. 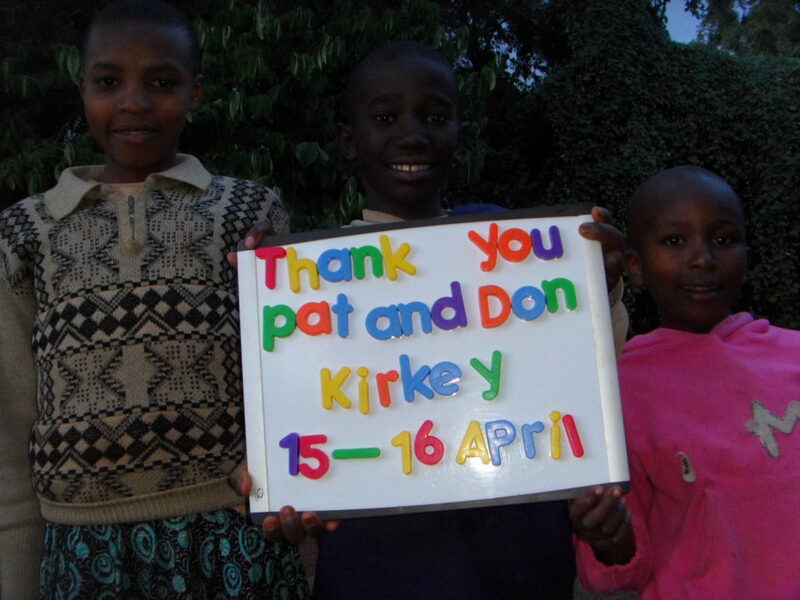 Pat and Don Kirkey made a donation to provide for support for the program as well as goats in honor of their grandchildren. 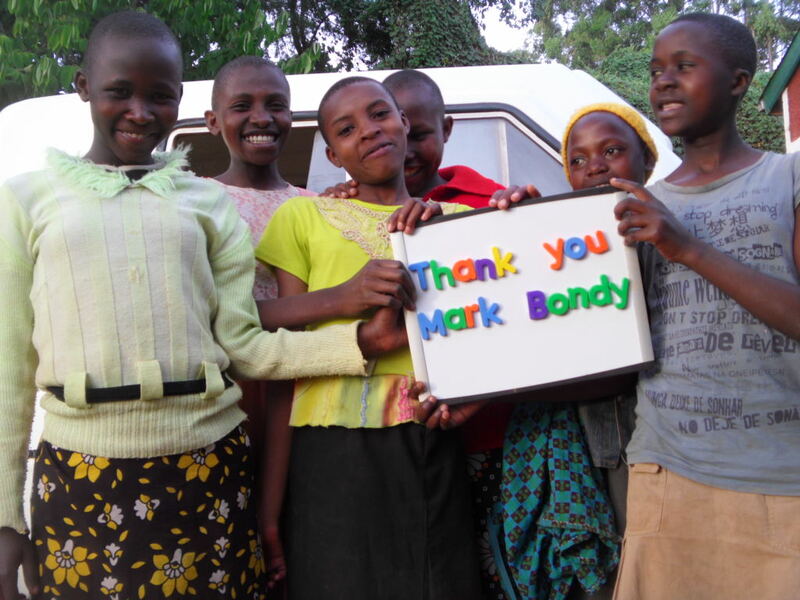 The days of support and the pictures of the goats are below. 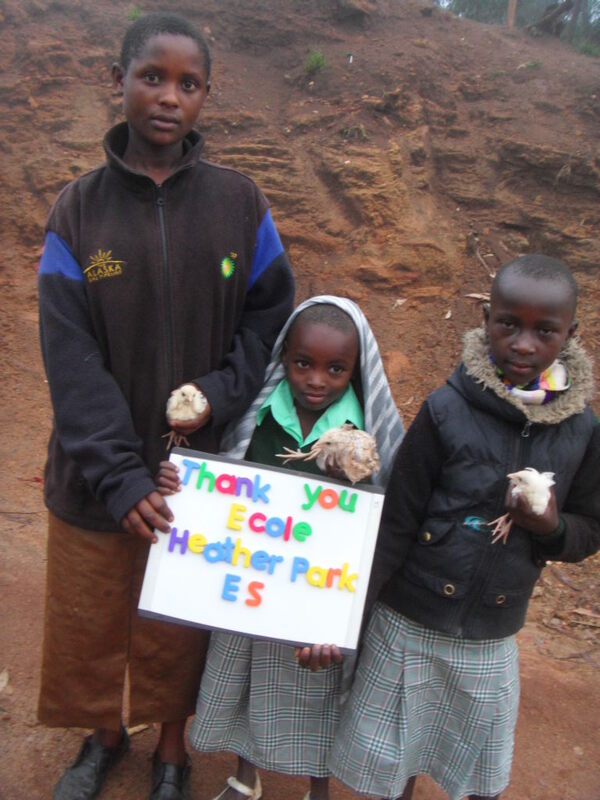 Heather Spinks-Turner donated money to purchase a goat. 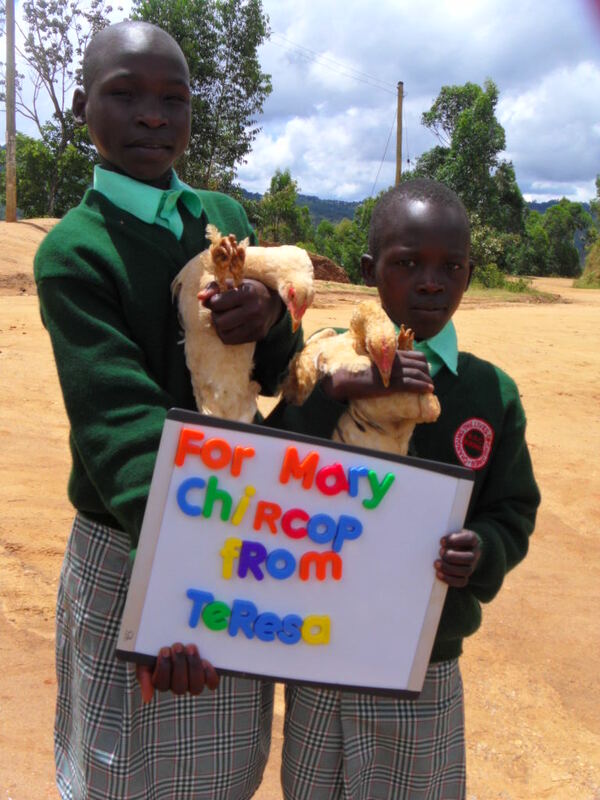 In the coming month (or so) she will receive a picture of the child receiving that goat. 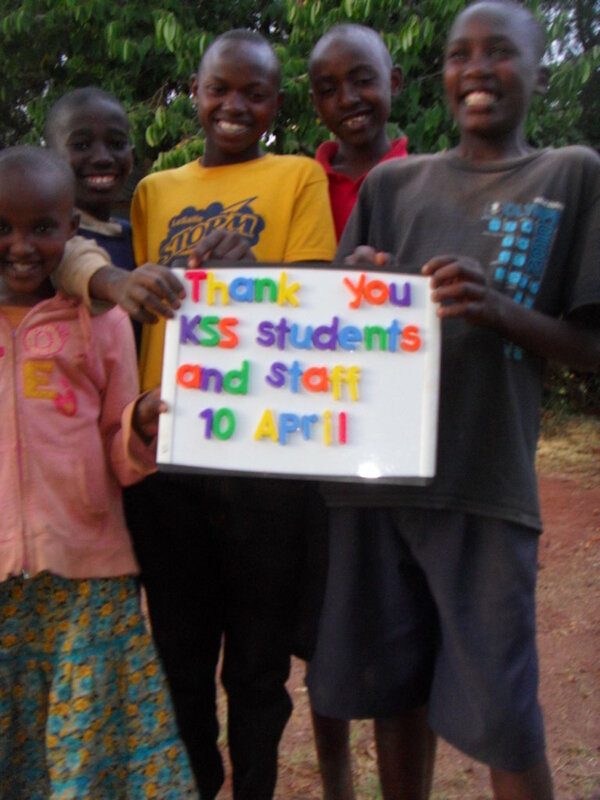 Kate made another donation to support Kyangoma School – where she did a two month placement in 2011. 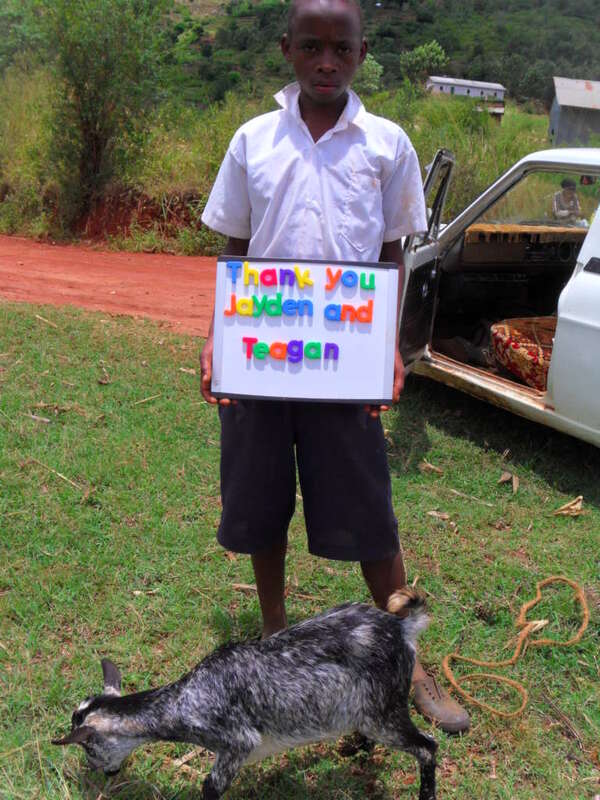 We just received a letter – and donation – from Jennifer Desouza and Richard Wilson-Singer to purchase a goat in honor of her niece, Tegan, who is having her first birthday today! Happy birthday Tegan! 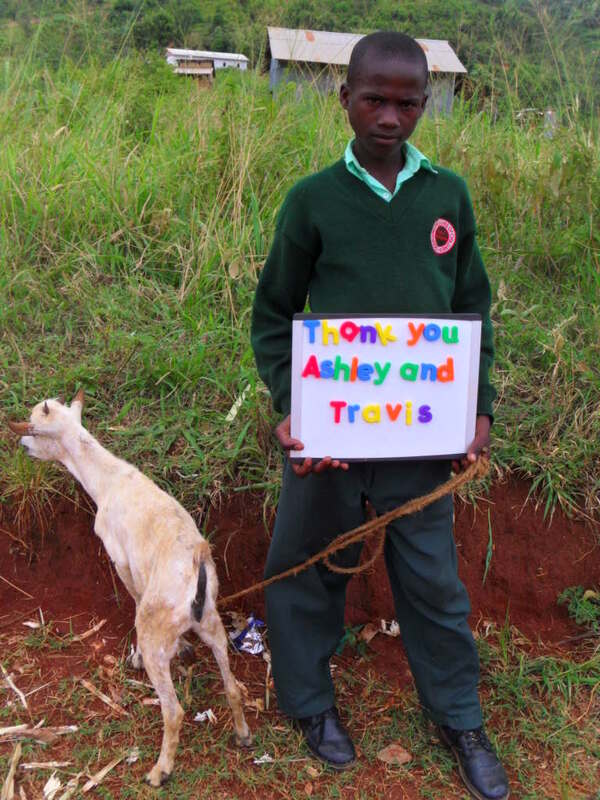 A picture will be sent to Tegan’s parents when the goat is given out. While in B.C. 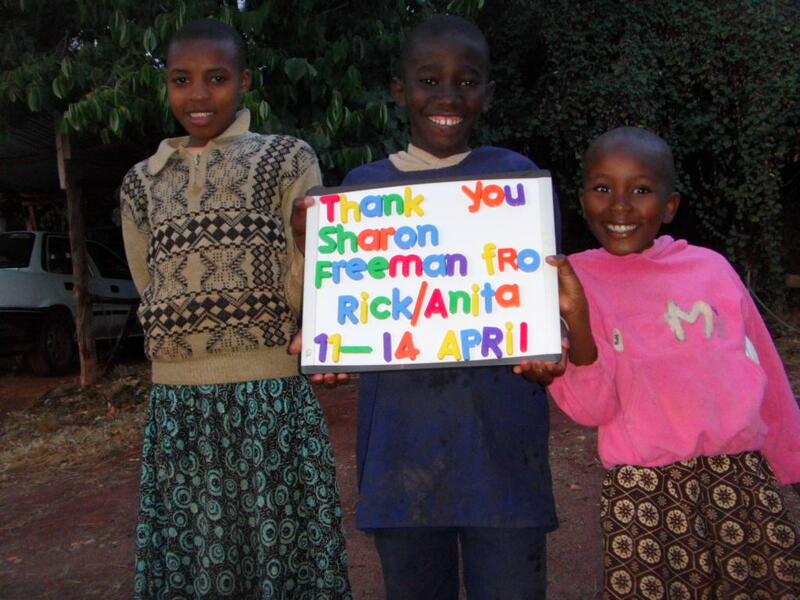 this tour my wife and I stayed at the home of our good friend Sharon. She is a wonderful host, but almost impossible to thank. 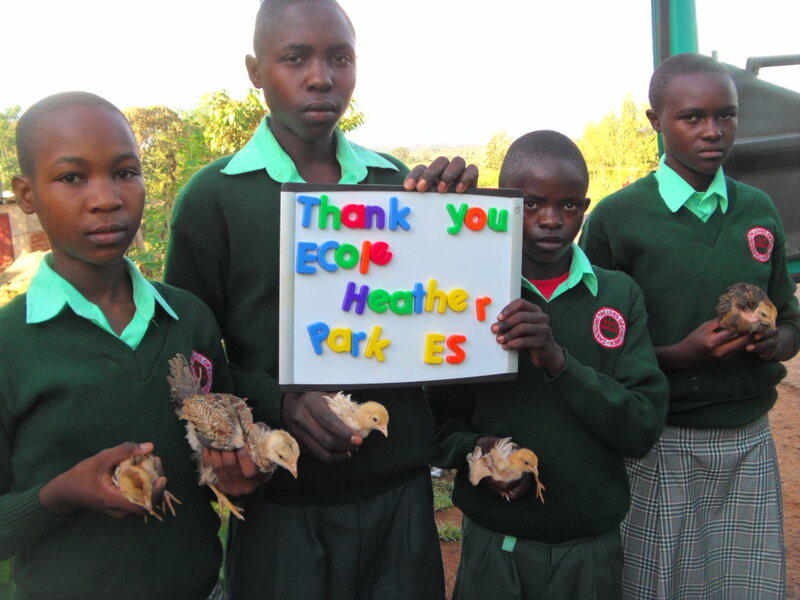 As a token of our appreciation we donated funds to support the program, in her honor. 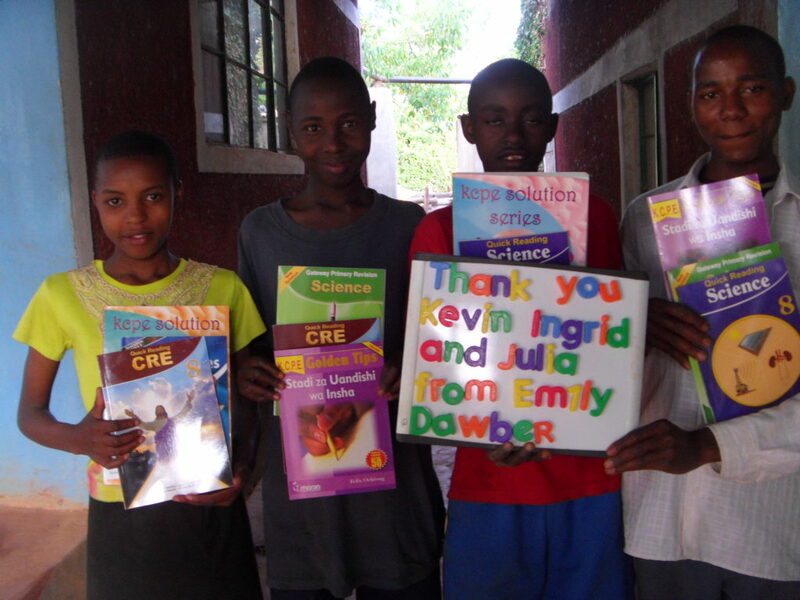 School supplies purchased by a donation from Emily Dawber that in honour of her professors at Queen’s University. 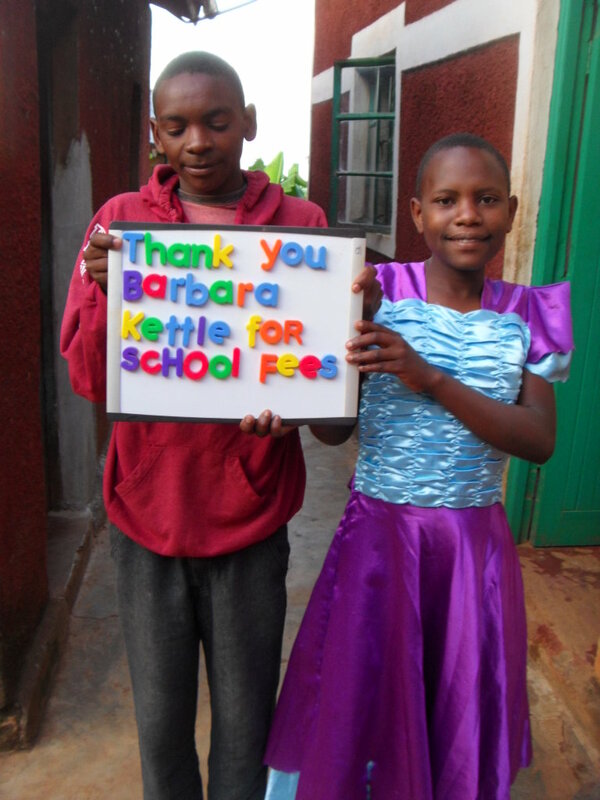 Donations made at the retirement gathering for Barb Kettle were directed to help pay for the high school fees of two of our children. 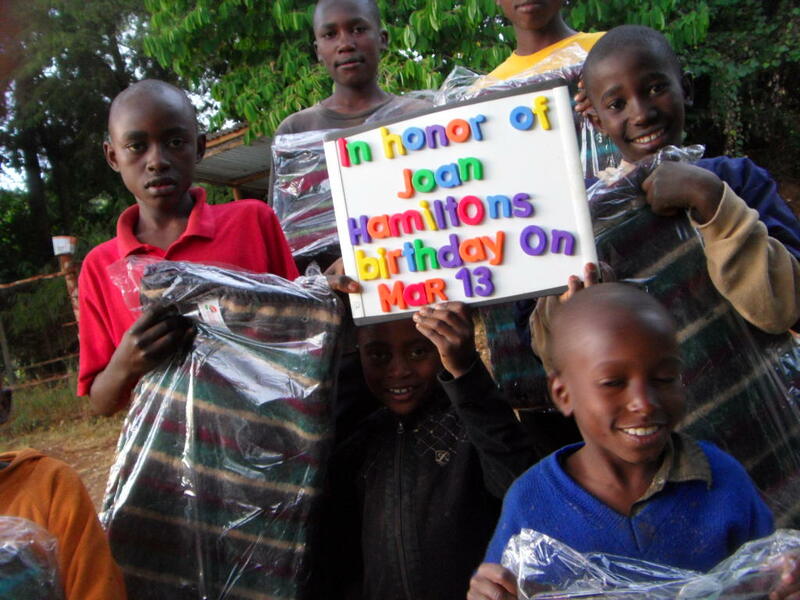 Some of our orphans will be sleeping under new, warm blankets tonight! 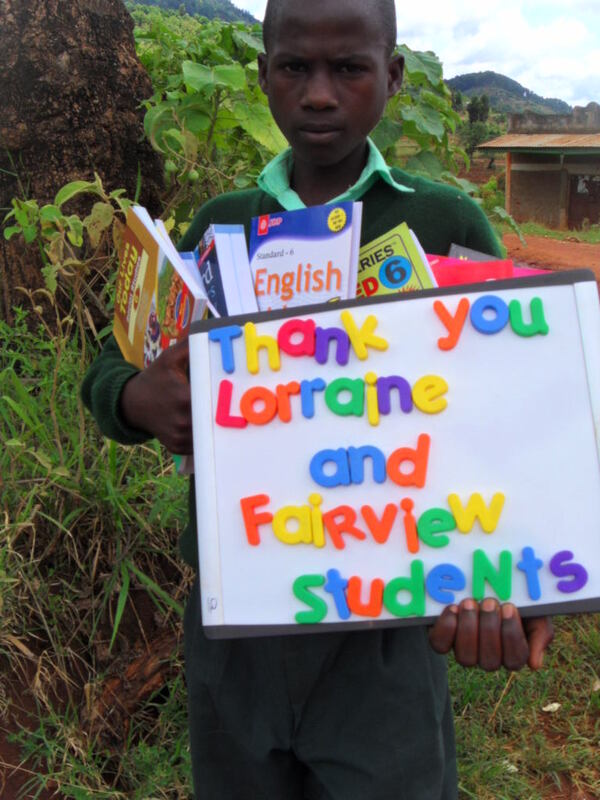 Thank you signs for Fairview for school supplies – here are a few of the pictures. 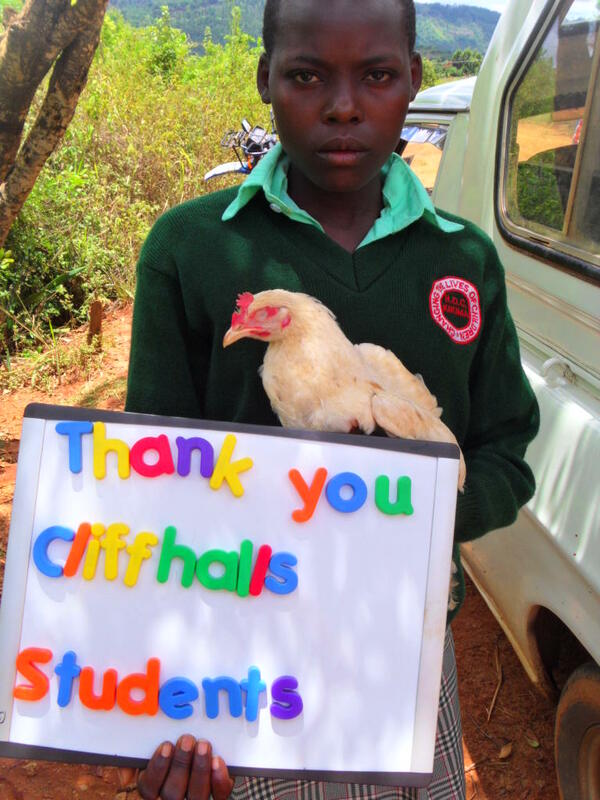 Chickens, chickens and more chickens! 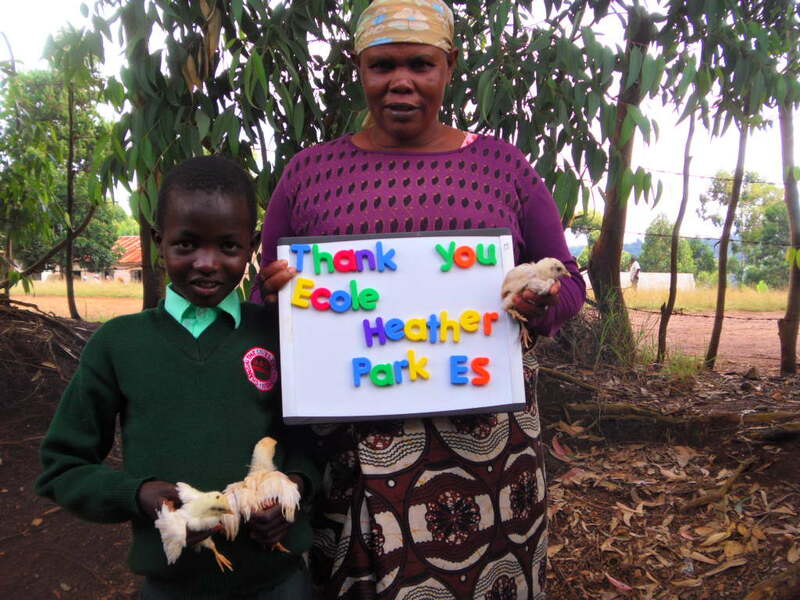 Here are an assortment of the 42 chickens purchased by donations from Ecole Heather Park and distributed to orphans throughout Mbooni district. 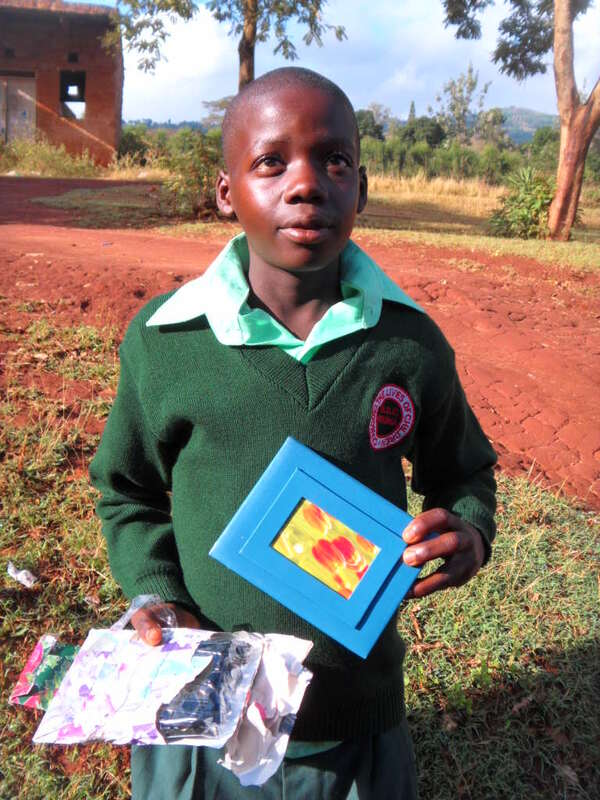 When sponsors send over a parcel we try to show them a picture of their child holding the items that were sent. 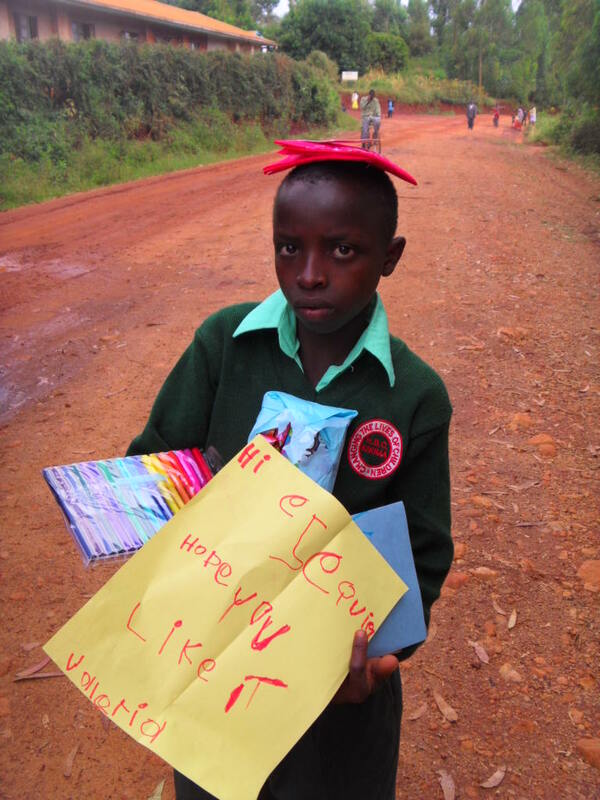 Here’s Ezekiel with the items sent by his sponsor Constanza and her family! 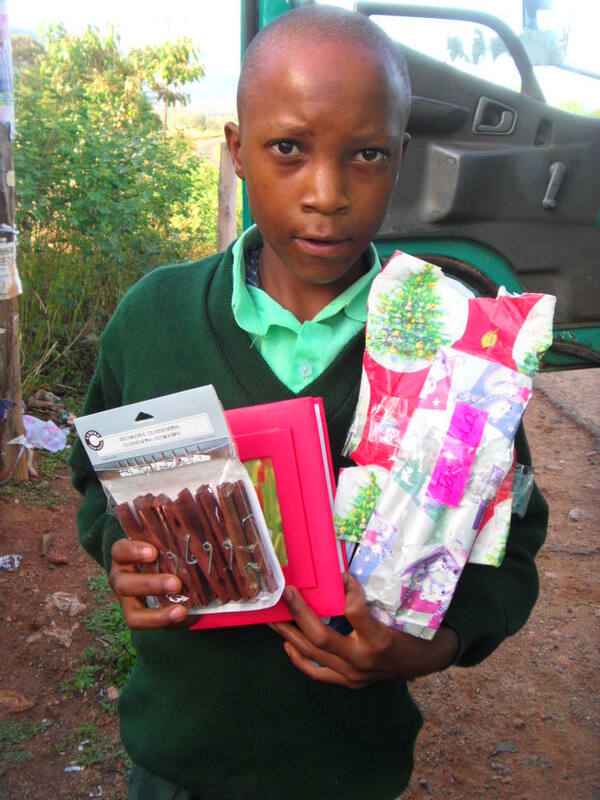 Parcels sent to the sponsored children of Stephanie, John and Mwithi. 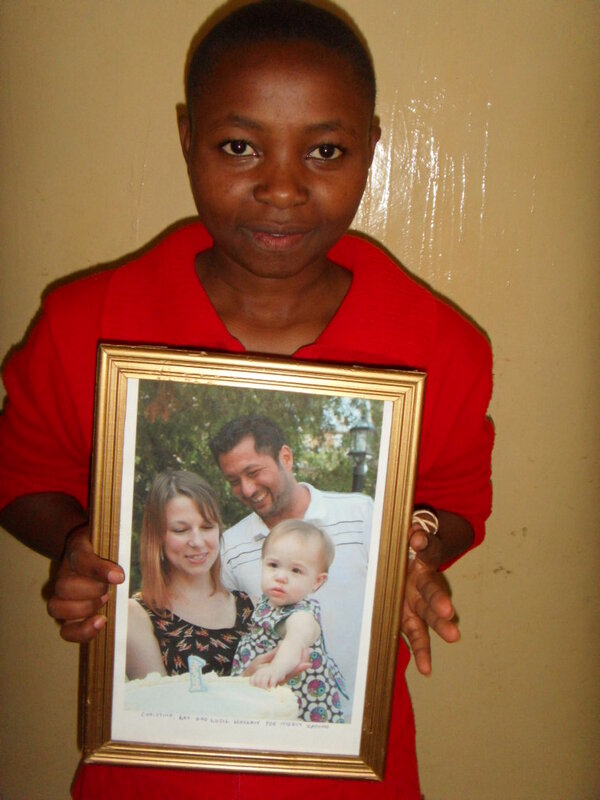 Christina, Ray, and their daughter Lucie, being held by their ‘oldest’ child Mercy.